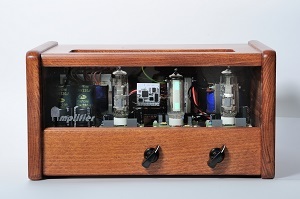 It is a tube stereo amplifier that uses customized wiring from the Tesla 4243 - Spoletto television set, manufactured in the 1980s. The amplifier is complemented by a fluorescent excitation indicator and by an up-to-date BLUETOOTH electronic circuit. 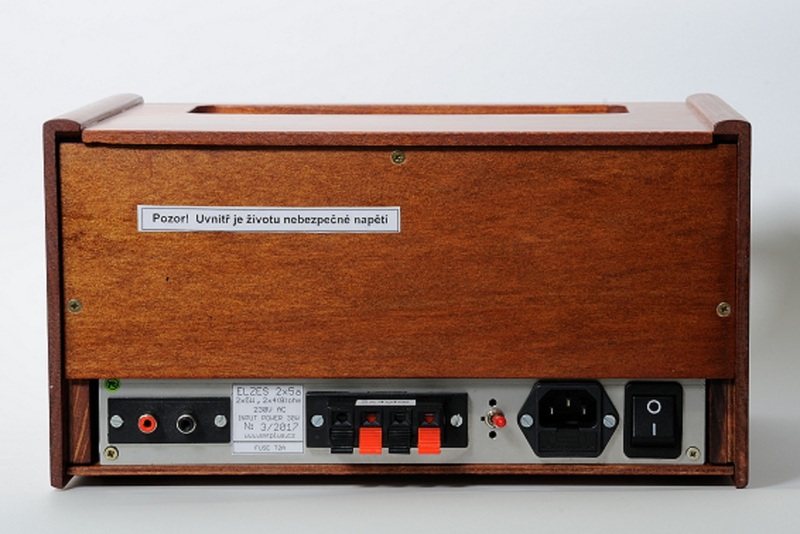 The amplifier has two identical low-frequency channels with 2 x 5W of output power. The immediate amplifier power and its excitation is indicated by a tape indicator. Two independent potentiometers can be used to control the gain. The low-frequency signal can be connected via the CINCH connectors (a high quality connection), or the BLUETOOTH connection can be activated to connect the amplifier wirelessly to a signal source, (e.g., using a mobile phone) or to turn it off. In case of a BLUETOOTH deactivation,the amplifier switches to a standby with a minimal power consumption after 5 minutes have elapsed. Since the vacuum tube connection is used (amplifier works in a class A), it is necessary to take into account the consumption of about 30W even if the amplifier is without signal. The device is housed in a wooden cabinet (solid wood) and is fitted with a front glass wall that allows the device to be observed during its operation (a shine of the vacuum tubes glowing). Output Power: 2x5W, Load Impedance: 4ohm or 8ohm (an option to switch as required), Input Impedance: 50kohm, Input Sensitivity: 0.7V for 4W, Frequency Response: I. 40Hz (-1.2dB) to 40kHz (- 1.8dB), Ush = 1.88V / 1kHz, 4ohm, II.50Hz (-0.5dB) to 30kHz (-0.3dB), Device Consumption: 30W, 1W Standby, Tubes: 2xPCL86, 1x EM87 , BLUETOOTH module: KRC-86B V4.0, Dimensions (L x W x H): 300x200x160mm, Weight: 5.6kg, Design:solid wood cabinet, a front glass wall.